K9 Choice Joint Support (Glucosamine Alternative) For Dogs Made from Eggshell membrane. 90 tablets. These bacon flavored tablets can be ingested whole or cut/crushed and sprinkled over food. K9 Choice Joint Support provides the nutritional raw materials necessary to promote joint health, stability and flexibility, plus a healthier skin and coat. * It is a natural alternative to glucosamine and works faster than glucosamine. K9 Choice contains Biovaplex tm, which is made from whey protein and eggshell membrane. K9 Choice Joint Support improves range of motion, promotes a natural anti-inflammatory response, provides antioxidants to reduce free radicals, and provides collagen for a lustrous and healthy coat. 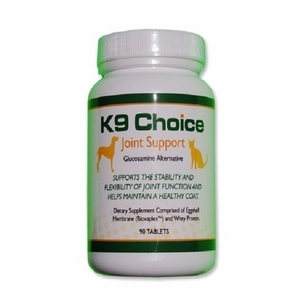 * K9 Choice Joint Support features key elements Collagen, Elastin, Desmosine, Glycosaminoglycans, and Transforming Growth Factor. The Biova company developed a special, patent-pending process to remove the thin membrane inside the eggshell and compose it into a tablet, along with other beneficial ingredients. Egg membrane is very high in nutrients and transforming growth factor. Transforming growth factor is found in only 3 places in nature, egg membrane being one of them. It takes multiple eggs just to make one tablet of our K9 Joint Support. For dogs under 25 lbs: give one tablet per day. For dogs 25-50 lbs: give 2 tablets per day. For dogs over 50 lbs: give 3 tablets per day. These chewable tablets can be given to dogs whole or broken/crushed and sprinkled on food. "The product is working great and is flying off the shelves! My receptionist's German Shepherd couldn't walk and experienced pain even with the medications Nsaids and gabapentin. We added this supplement and the dog is doing great. Now off most of the pain meds." � Dr. Greg Reichenberger, DVM, West Wichita Animal Clinic. "Hi Steve, this email is in regard to the K9 Choice Joint Support product that we have been purchasing from you. We have two Siberian huskies, Amber is our female and is 11 years old. She had an accident about two years ago and tore up her knee very badly. She needed a very expensive surgery. After the surgery, her recovery took a long time and the vet told us she needed glucosamine in order to complete the healing. We tried the glucosamine with asu and she became deathly sick. We then tried just glucosamine and she could not tolerate it. We went back to the vet and they prescribed Asian herbs. Again, she could not take them. At this point my wife and I became very troubled, so after much research, I came across your product K9 Choice. Let me tell you, everything is different. Amber takes the K9 Choice joint support with absolutely no problem and she runs around like a little puppy, jumping on and off the bed, which she could not do before. There is no sign that she ever had surgery. We are now giving our other Siberian, Cheyenne- who was beginning to get a little stiff in the joints- the K9 Choice joint support and he too has responded great: running, jumping and bouncing around. It is like a miracle to us. Thank you for this product; it is a great natural alternative. Full stars from me and my wife. "-Mike P.
Results from a study involving 57 canines with limited joint mobility demonstrated positive results within 7 days of taking Biovaplex. 100% of subjects indicated increased activity and mobility by the conclusion of the 28 day study.